Tibo Smart Amp review | What Hi-Fi? Tibo claims to have invented the world’s first smart amp, which in itself sounds impressive, though it’s not always exclusively an accolade. For example, someone must once have had the world’s first nosebleed, and for them it was probably quite distressing. So what is a Smart Amp, and why is Tibo so proud to have made it? Well, it’s part of the company’s new range of smart, multi-room audio products, which also includes the Vogue 3 wireless speaker we gave a four-star review a couple of months back. The Smart Amp is a Class D amplifier with a power output of 50W into 4 ohms. As well as wireless connectivity via Bluetooth and wi-fi, there are physical connections for optical and aux. It also has direct presets built in for Spotify, Deezer and TuneIn radio, making it a relatively impressive skillset for a £250 stereo amplifier. It isn’t exactly the most eye-catching of units – more jacked car stereo than premium hi-fi product. It’s bare but for a few pre-set buttons and small dial on its face – but it’s entirely functional and we will always take a more basic appearance if it means impetus has been thrown behind sound quality, especially at this price. There is a remote control included, which treads the same aesthetic path. It lacks nothing in terms of functionality, but we predict many will decide to control the Smart Amp via Tibo’s app. In our Vogue 3 review, we noted a few bugs in the app, particularly when you throw more Tibo kit into the mix. However, it’s intuitive enough that most people should have no trouble finding their way around it. Tibo provide us with a pair of its Legacy standmount speakers, but we end up testing the Smart Amp by using some Q Acoustics 3020s instead, which we believe are more capable of revealing the amp’s talents. Hooking it all up is a doddle, and once connected via wi-fi we begin by playing REM’s New Adventures In Hi-Fi – a rather apt choice considering Tibo’s claim that this is the world’s first smart amp. Having already tested products from the range, we expect to be greeted with a similarly even balance and an overall easy-to-listen performance. In that respect, the Smart Amp doesn’t disappoint. There’s no overt rolling off at either end of the frequency range, but the Tibo also manages not to over-emphasise any hard edges. There’s also a decent amount of detail; there’s texture to the moaning electric guitars that glide through E-Bow The Letter and crunch on Departure, and exposure of the rooms in which this somewhat ragtag album was recorded. But dynamically and rhythmically, it’s just flat. There isn’t anything here to grab us, to make us really listen. Quite often it becomes background music, which is testament again to how generally undemanding it sounds, but shouldn’t really be the case when we’re trying our best to test it. Switching to Vivaldi’s The Four Seasons, recomposed by Max Richter, the Tibo fails to give the piece any real triumph. Rhythmic patterns are lost as the emphasis is dulled on leading notes and any punch seemingly sacrificed in lieu of an inoffensive, but overly placid, performance. We switch between the Smart Amp’s range of inputs and, though there are the expected gains in resolution when taking physical connections over Bluetooth for example, its general character remains the same – listenable, but bland. 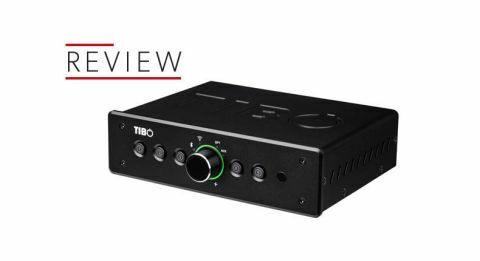 Tibo’s Smart Amp is okay, but that’s really as far as it goes. If we entered a room where one was playing we wouldn’t feel any need to switch it off – the ultimate example of damning with faint praise – but nor would we feel any guilt in talking over it. What it does is spot on; how it does it requires a little more panache.